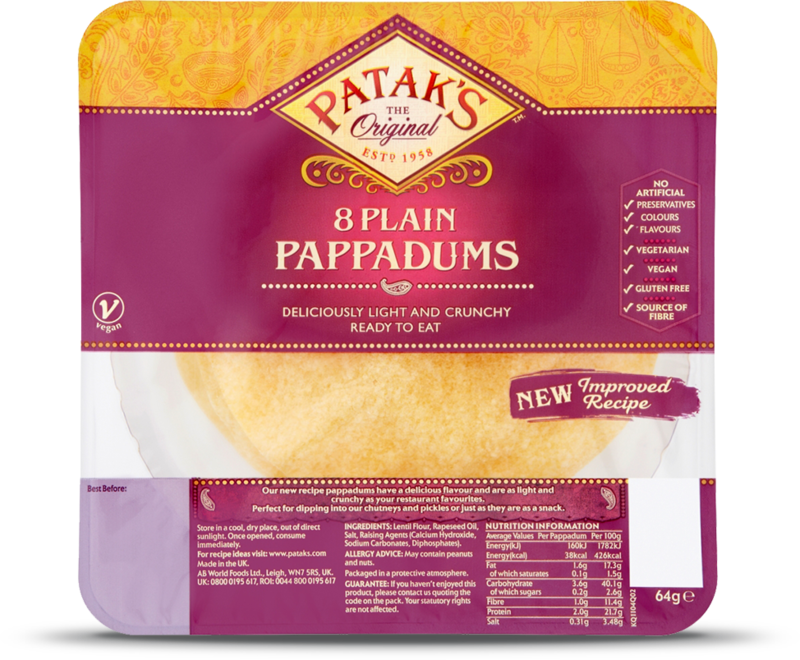 Our new recipe pappadums have a delicious flavour and are as light and crunchy as your restaurant favourites. They are perfect for dipping into our chutneys and pickles or just as they are as a snack. Lentil Flour, Rapeseed Oil, Salt, Raising Agents (Calcium Hydroxide, Sodium Carbonates, Diphosphates). Chicken Korma is one of the most popular dishes in Britain, and is one of the mildest of the Indian curries - making it popular with kids and people who don't like too much spiciness in their food. This classic Chicken Korma recipe uses Patak's Spice Paste - which is a delicate blend of spices with coconut - along with a rich blend of other wonderful flavours and is sure to be a hit with the whole family. A super delicious vegetarian side dish, this is incredibly easy to make and I served this up as part of my Diwali menu - but of course makes a great potato dish anytime. Simply delicious, it uses the zesty flavours of our Tikka Masala Spice Paste, with the peanuts adding a lovely crunch. This is one that is sure to impress at dinner parties or even just for a special weekend meal. The succulent and juicy lamb tastes fantastic with the tantalising mariande of Rogan Josh Spice Paste, black pepper and mint. Another great way to bring the wonderful spices of India to a classic British restaurant favourite.